My mentor is Bob Mackenzie, who is the head gardener and has worked at Adams for 25 years. If you were ever a part of Branching Out, you would definitely know Bob. He has strongly supported Branching Out ever since the program started and always has interesting stories to entertain his interns. 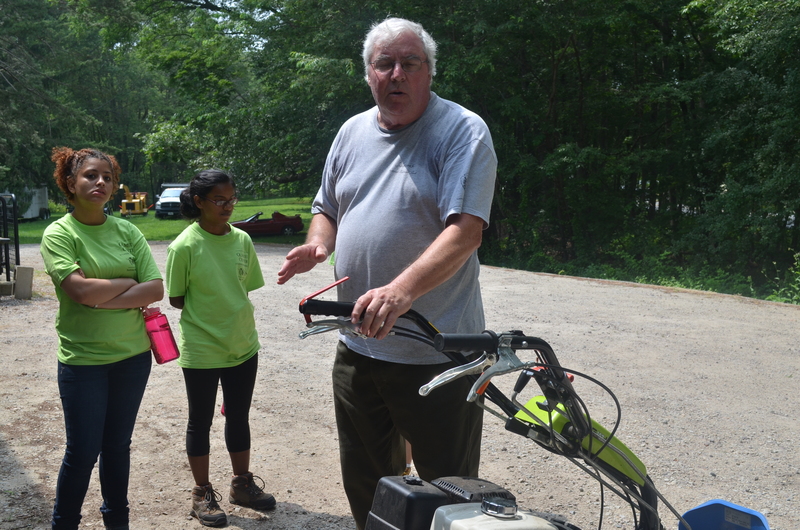 Bob is also extremely experienced and has taught me so many things this summer, not just about gardening but about multiple aspects of the park. He started working at Adams in his forties. He initially applied to be a Museum Tech for the park, but was eventually hired as a WG-3 laborer in maintenance. Bob has worked at several different places. After he served in the Army during the Vietnam War, he worked for the telephone company. After this, he was a Teacher/Houseparent/Counselor/maintenance worker at a private boarding school. Bob has also worked as the aquarist at the New England Aquarium and was a part of the marine mammal rescue team. In terms of education, Bob has attended several community colleges and attended UMass Boston for almost two years. Bob’s favorite part of working at Adams is being a part of the National Park Service and contributing to landscapes that will continue to persist through future generations. Bob has been an extremely funny, knowledgeable, and overall wonderful mentor this summer and I couldn’t have asked for a better park mentor. Thank you so much for the interesting stories, funny jokes, and overall wonderful experience at Adams! 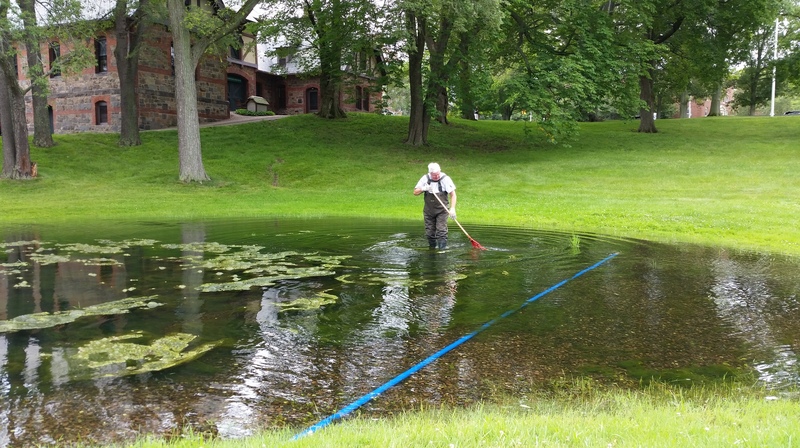 Bob raking the algae out of the pond. Bob teaching the field team how to use the sickle bar mower. Bob is an incredible person and has been such a strong supporter of the Branching Out program! Thank you for recognizing his contributions. I am glad that you mentioned Bob’s service as a soldier. While I was in community college studying plant propagation 101, (that was 1977) Bob was in the service or maybe just back from his tour of duty in the service. I was able to get my advanced degree due to people like him and many of my older cousins doing their duty when they were called for service in the military. I appreciate their sacrifices during those difficult times. One thing I learned from Bob when I worked with him is how to keep the equipment fine tuned and working well. He is not afraid if something fails or breaks, he figures out how to fix it and makes it work. Even that time his mower caught fire and made a loud BANG noise, he calmly left the mower, got a fire extinguisher, put out the fire then went to lunch. After lunch he wanted to start it up again and figure out how to fix it!. We were all scared that it would catch fire again. His boss decided no, don’t turn it on again. He would buy a new mower. Now they have the special equipment for mowing the tall meadow grasses.